Cook Memorial Public Library District has an Intergovernmental Agreement with the Village of Vernon Hills to build and maintain a parking lot on Village-owned land immediately adjacent to Aspen Drive Library. 51 additional parking spaces will be added, bring the total number of spaces to 119. Cost of construction is $305,000 with funds acquired from library reserves. 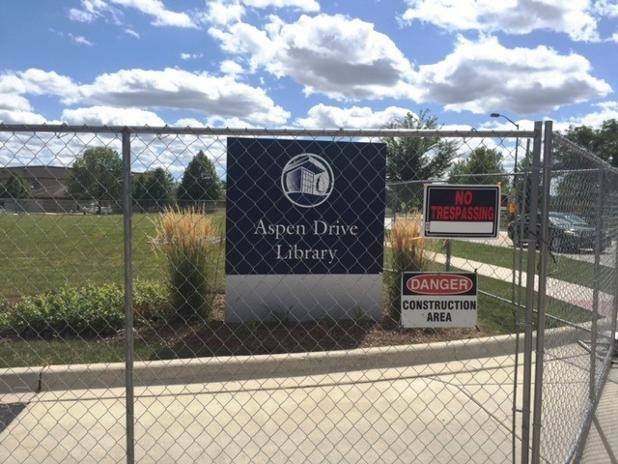 Extra spaces will address an immediate need for additional parking @ Aspen Drive, especially during peak times and during library programs with high attendance. The additional parking will allow the library to increase capacity for popular programs. Work is expected to be completed by the end of October. Construction of the parking lot is not expected to affect library operations. All construction activity will be confined to the vacant lot south of the library. The construction site will be fully fenced in and all truck access to the site will be made via a temporary driveway off Aspen Drive. However, please note that much of the sidewalk adjacent to Aspen Drive will be closed. Pedestrians will be directed to the west side of the street via existing and temporary crosswalks. The Library District is very appreciative of the support the Village of Vernon Hills has provided. They’ve been an essential partner in providing library services to the southern part of the district in Vernon Hills – services that will soon be enhanced by increased parking. August 29, 2015 in The Scoop.